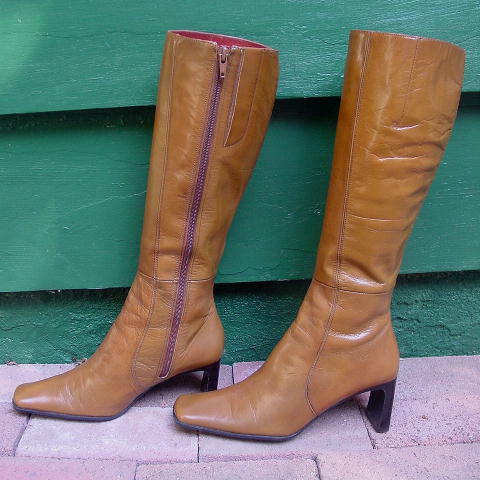 These dark camel color leather boots are by Nine West and have a balance that is manmade. They have 15" long inner zippers, stacked heels, and square toes. The left heel has a line indentation and the right heel has some scuff marks. 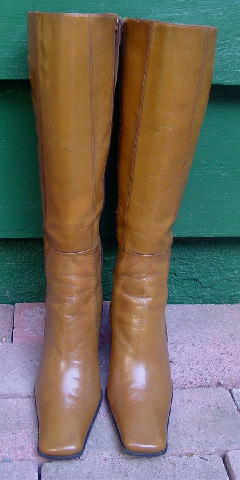 There are sandy-rust color leather linings. They have an upper inner 3/4" hidden elastic panel. 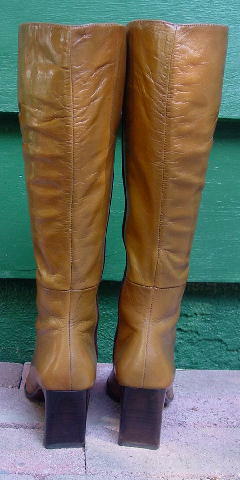 The leather has wrinkles and the left boot has a dark spot on the center arch area. The upper front soles have nonskid rubberized black panels. The light areas on the boots in the pictures are just reflections. She takes a larger size since she had a baby. top of boot to bottom of heel 17"